Deluxe hardback collector's edition signed by x of the contributors, as well as the cover artist. This edition also contains "Sinner", the prequel previously only available as an e-book. Signed by Erik Bear, Greg Bear, Joseph Brassey, Nicole Galland, Cooper Noo, Neal Stephenson, Mark Teppo and Mike Grell. 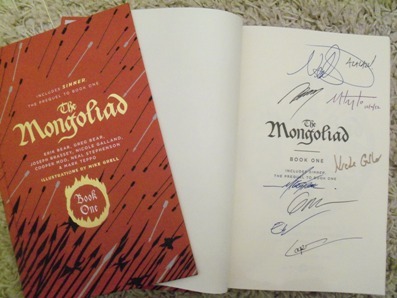 Synopsis : This handsome hardcover edition of The Mongoliad: Book One features an exquisite cover with foil stamping, deckled edges, a ribbon marker, an illustrated character glossary and a Foreworld map printed on the end-sheets. It also includes Sinner: A Prequel to the Mongoliad. This short story was previously available only digitally and sets up characters and events in The Mongoliad. The first novel to be released in The Foreworld Saga, The Mongoliad: Book One, is an epic-within-an-epic, taking place in 13th century. In it, a small band of warriors and mystics raise their swords to save Europe from a bloodthirsty Mongol invasion. Inspired by their leader (an elder of an order of warrior monks), they embark on a perilous journey and uncover the history of hidden knowledge and conflict among powerful secret societies that had been shaping world events for millennia. But the saga reaches the modern world via a circuitous route. In the late 19th century, Sir Richard F. Burton, an expert on exotic languages and historical swordsmanship, is approached by a mysterious group of English martial arts aficionados about translating a collection of long-lost manuscripts. Burton dies before his work is finished, and his efforts were thought lost until recently rediscovered by a team of amateur archaeologists in the ruins of a mansion in Trieste, Italy. From this collection of arcana, the incredible tale of The Mongoliad was recreated. Full of high adventure, unforgettable characters, and unflinching battle scenes, The Mongoliad ignites a dangerous quest where willpower and blades are tested and the scope of world-building is redefined. About the authors : Neal Stephenson is primarily a fiction author and has received several awards for his works in speculative fiction. His more popular books include Snow Crash, The Diamond Age, Cryptonomicon, The Baroque Cycle, and Anathem. Erik Bear lives and writes in Seattle, Washington. He has written for a bestselling video game and is currently working on several comic book series. Greg Bear is the author of more than thirty books, spanning the thriller, science fiction, and fantasy genres, including Blood Music, Eon, The Forge of God, Darwin’s Radio, City at the End of Time, and Hull Zero Three. His books have won numerous international prizes, have been translated into more than twenty-two languages, and have sold millions of copies worldwide. Joseph Brassey lives in the Pacific Northwest with his wife and two cats. He teaches medieval fighting techniques to members of the armed forces. The Mongoliad is his first published fiction. Nicole Galland (writing as E.D. DeBirmingham) is the author of I, Iago, as well as The Fool's Tale, Revenge of the Rose, and Crossed: A Tale of the Fourth Crusade. An award-winning screenwriter, she is married to actor Billy Meleady and, unlike all her handsome and talented co-writers, spends no time at all hitting people with sticks in Seattle. Mark Teppo is the author of the Codex of Souls urban fantasy series as well as the hypertext dream narrative The Potemkin Mosaic. Cooper Moo spent five minutes in Mongolia in 1986 before he had to get back on the train—he never expected to be channeling Mongolian warriors. In 2007 Cooper fought a Chinese long-sword instructor on a Hong Kong rooftop—he never thought the experience would help him write battle scenes. In addition to being a member of The Mongoliad writing team, Cooper has written articles for various magazines. His autobiographical piece "Growing Up Black and White," published in the Seattle Weekly, was awarded Social Issues Reporting article of the year by the Society of Professional Journalists. He lives in Issaquah, Washington, with his wife, three children, and numerous bladed weapons.